Ali Vincent was the first female winner of the television program “The Biggest Loser” and lost 112 pounds while on the show. Despite being athletic and popular in high school, by her early 30s Vincent had gained weight and was struggling with low self-esteem. Her book Believe It, Be It: How Being the Biggest Loser Won Me Back My Life recounts her personal story as well as providing readers with motivation and practical strategies for successful weight loss. Ali Vincent offers readers helpful advice and practical strategies that will facilitate the change to a healthier lifestyle. She outlines the way she approaches some of the challenges that arise in daily life such as navigating family dinners and other social situations involving food. One of Ali Vincent’s recommendations is to keep a food journal because this helps you to stay accountable in regards to what and how much you are eating. She also advises dieters to be very clear about their goals and to find social support either with friends, a personal trainer or online. Although Believe it, Be It does not include a detailed meal plan it does include healthy recipes and general advice. Protein shakes, turkey, chicken breast, nonfat milk, almonds, hummus, watermelon, celery, baby carrots, cucumber, string cheese, strawberries. Ali Vincent encourages dieters to make fitness an important part of a health supportive lifestyle. In Believe It, Be It she outlines her current exercise regime and explains that she never goes more than three days without exercising. She also describes how she still wears a BodyBugg every day to monitor the amount of calories she burns with daily physical activities. 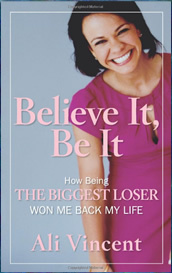 Ali Vincent’s Believe It, Be It: How Being the Biggest Loser Won Me Back My Life retails at $21.99. Ali Vincent’s successful weight loss is motivational. Many readers will relate to the experiences of the author. Includes practical strategies for weight loss and maintenance. Believe It, Be It, Does not include a detailed diet or fitness plan. Does not include any new information. Believe It, Be It will appeal to fans of The Biggest Loser particularly for the inclusion of behind the scenes details about the show. This book does not include a step-by-step diet plan but rather is more of a memoir of Ali Vincent’s experiences and also provides practical tips and strategies for readers who wish to lose weight by changing to a healthier lifestyle. Vincent, A. (2009). Believe it, be it: how being the biggest loser won me back my life. Rodale.